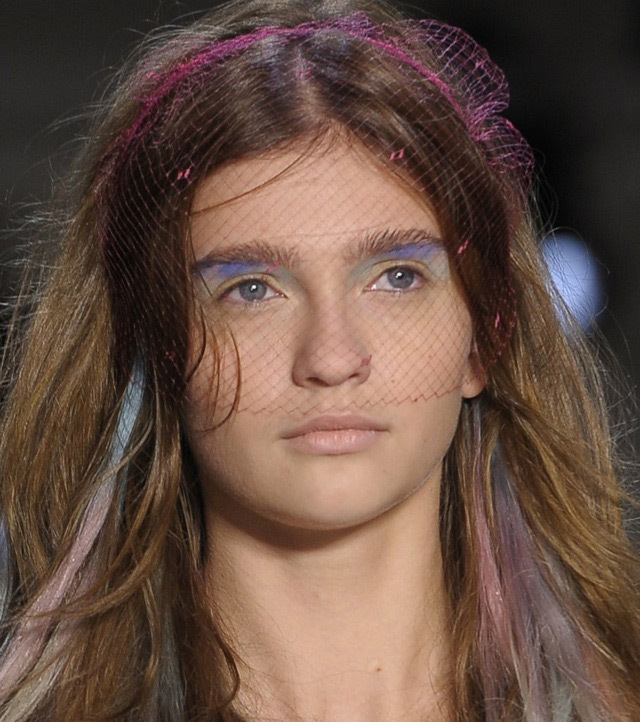 Over the past few years, we have watched as hair color has planted itself at the forefront of statement-making hairstyles (above, streaks of color on the runways at Peter Som’s Spring 2013 show). Now, as the seasons change, it isn’t so much about what new style you are going to create, but rather how you are going to tweak your color to be on trend. At the 2013 Wella Professional TrendVision Awards, we chatted with Wella’s Global Creative Director Eugene Souleiman (who is often spotted styling hair backstage at fashion week—he did over 30 shows this year) about how he helps stylists take the trends to the streets and what he thinks color has in store for us over the next few seasons. The trends that we see on the runways and at shows like TrendVision are obviously very creative and dreamlike. How do you make them accessible? Eugene Souleiman: Whenever I look at a style, I take away something very visual from it, but it doesn’t mean you can take a virtual replica of that look. You can definitely soften these looks, whether you choose to wear color underneath your head or even on top. When you look at the hairstyles you shouldn’t translate them directly – they’re meant to inspire. Where do you tend to find your inspiration for styles? Everywhere—life. I cut my daughter’s fringe really short this year and the inspiration for Yohji Yamamoto came from that. She moved, I cut it, she moved, and it was short. But anywhere really. Art, travel, music, comics, anywhere and everywhere. I’m really lucky because I have a job that encourages me to be a child and be playful and look at the world with bright eyes. Color has been a huge trend for a while now. Why do you think that’s true, and do you think the trend will stick around? For the past three years, I thought, “When is it going to stop?” And it hasn’t, so I’m not sure it will stop. I think it might become an intregal part. I think it’s just a new way of looking at hair that has become a part of it. I don’t think it will go away, maybe it will become more subtle and maybe next year it will go back into one color. But honestly, it helps me with what I do because it adds a focal point, and I love a little bit of processed hair to play with. Do you think there has become a bit more of an “edge” when it comes to hair? I think people are changing their opinions about what’s beautiful and what’s not beautiful.